Giving pupils the role of clients for a new school building within a tight budget and programme. We were architects for the extension and refurbishment of Falmouth School’s existing 1960s design & technology block. 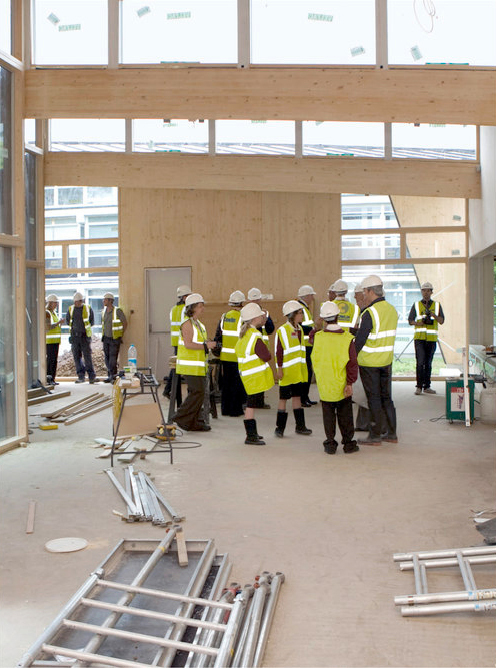 The project had an unusual commissioning process with a group of 11 pupils selected from Year 9 and 10 as clients. The design used solid laminated timber panels illustrating how a bespoke but prefabricated solution can be efficient environmentally and programmatically and still create an exceptional building. "The success of the project lies not only in the creation of a new identity for the design & technology block, but in building up the confidence and pride of students... Not just half a million pounds to reinvent a failing school then, but some big thinking from young minds. And you can’t put a price on that."